It’s another Nate Berkus kind of day. It wasn’t meant to be an interior sort of day. Today was about painting outside walls, I attempted to paint some walls but the Cornish summer weather got the better of me and as fast as I put the paint on, it was diluted with heavy rain showers and rinsed off the wall. Time to tackle the spare room and create a feature wall. Today’s problem is barometers . We have two! Something that is no longer needed now every smart phone or tablet has a weather App. But back in the day they were considered a fitting retirement gift from employer to worker. Ours represent a fathers and grandfathers employers gratitude for years of loyal service. It felt too disrespectful to send these two bits of history to the charity shop. I had boxes of framed photographs to sort through and a rusty round mirror that I thought could make an interesting addition to the wall. I picked though the photographs and selected the ones that seemed to match the dark wood of the bed and the barometers . Once that was done I measured out the wall space and marked the same area on the floor. Then it was just time to play around with positions and weed out the pictures or frames that didn’t work in the hanging plan. Once I was happy I started putting nails in the wall in the right position for my chosen pattern, after hanging the barometers and mirror I started putting the photographs into their positions. I only needed to switch a couple of frames that didn’t quite work as well on the actual wall. I’m pretty pleased with this , it has been a good use of a rainy day. 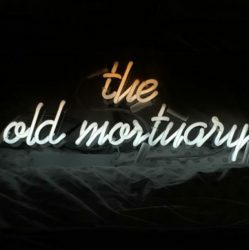 Previous PostPrevious theoldmortuary- real life interior design.